Be Social: Please follow us on social media to promote orienteering. As a continuation of the AOA Retreat and feedback from our members, the AOA Board of Directors created a new strategic plan which outlines the AOA goals for the next 3 years. The strategic plan is aligned with the Alberta Sport Connection Accountability Framework and Orienteering Canada's strategic pillars to promote and deliver quality sport in Alberta. After the successful pilot to get more juniors involved that was held at the provincial spring camp (AOA subsidized club coaches to bring a group of juniors to the camp) AOA is offering the next subsidized program to promote attendance and support technical coaching at the competition for the 2018 Alberta Orienteering Championships. The camp provides carpooling and 2 nights’ accommodation (no meals provided). For whom? (First come first served; max 45 participants). Cost includes carpool gas subsidy and two nights of accommodation. This camp is self-catering: no meals are provided. For more details visit the Registration link on the AOA website: Pre-Registration opens August 1st, 6 pm. Watch our short Video: Orange Marks the Spot- Outdoor Adventure Program. AOA and the Be Fit for Life Network have partnered to create a new resource for outreach. The first year pilot programs were a big success with positive feedback and interest that far exceeded our expectations. The AOA also partnered with the organizations shown below to implement orienteering grassroots programs. Over 30 activity leaders were trained and more than 1000 kids experienced a fun outdoor adventure program this year. A partnership was established with Sport 4 Life Cochrane to start the first Outdoor Adventure Program. The first program filled up with 35 participants and received great feedback from parents, volunteers and community leaders. There is a great potential for a permanent program in Cochrane which would fill one of the requirements from Alberta Sport Connect to deliver programs in different zones in the province; AOA will continue with the program in the fall. We also presented the program to the Town of Cochrane council and they are very supportive and would like to see seniors/adults get involved as well. Be Fit For Life partnership: We receive continuous support and will be working together on the next lesson plans for older age groups. Officials: Thanks to Marion Owen, two officials training courses were held. O200 was held in Calgary and O300 was held in Cranbrook in collaboration with Orienteering BC. Coaches: A community coach course was held in Calgary with 11 people attending. For the Introduction to Competition level, the most important next steps will be to complete the multisport module courses and apply for evaluation to complete certification. For officials and coaches in training: make sure to make note of all related activity you do this season and then report your accomplishments at the end of the year. Please visit ourwebsite for details. Check out our new Concussion in Sports page to learn about how AOA helps participants to stay safe. If you are interested in becoming an official or coach to support your local club don't hesitate to reach out to info@orinteeringalberta.ca. The local Wednesday night events and Forest B events had strong attendance from both clubs. Thank you to our awesome volunteers, and keep up the good work. 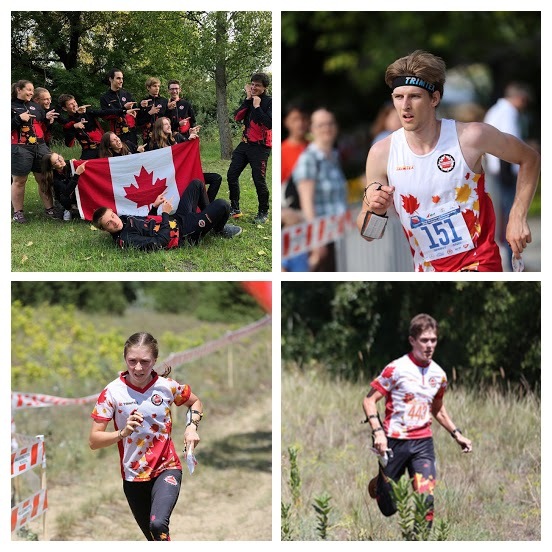 Outstanding performance from Team Canada at the Junior World Championships in Hungary! Best place in Canadian history for Jaan Erik Naes for long distance, 13th place, and Emma Waddington in 6th place at the sprint final. Canada’s sprint relay team was 18th. Alberta athlete Michael Svoboda started with a great preparation in Europe but unfortunately injured his knee and so couldn’t perform at his best. Michael managed to participate and had a satisfying result at the Middle distance: M20B (60) - 30 Michael Svoboda. The Canadian team had a great time at the World University Games that were held in Finland. Emma Waddington earned a respective 8th place and the team was 18th in the sprint relay with Michael Kondro from FWOC running the 3rd leg. Congratulations to EOOC coaches on their strong finishes in the World Masters Orienteering Championships in Copenhagen, Denmark. Notable finishes included: Geraint Edmunds placing 34 out of 81 athletes in the A final for Sprint, Marilyn Edmunds placing 18 out of 57 athletes in the C final for the Middle, Geraint placing 8 out of 84 in the B final for the Middle, Marilyn placing 20 out of 57 athletes in the C final for Long distance and injured Greg Yarkie placing 22 out of 84 athletes in the D final for Long Distance. Here is a cool video link about World Masters long final. August 15-16 the 2018 Sass Peepre Junior Training Camp will be held before the NAOC events. August 17-24 - North American and Canadian championships 2018 NAOC and COC in Whitehorse, Yukon. Registration is now closed, but you can follow your fellow orienteers on line during the competition. 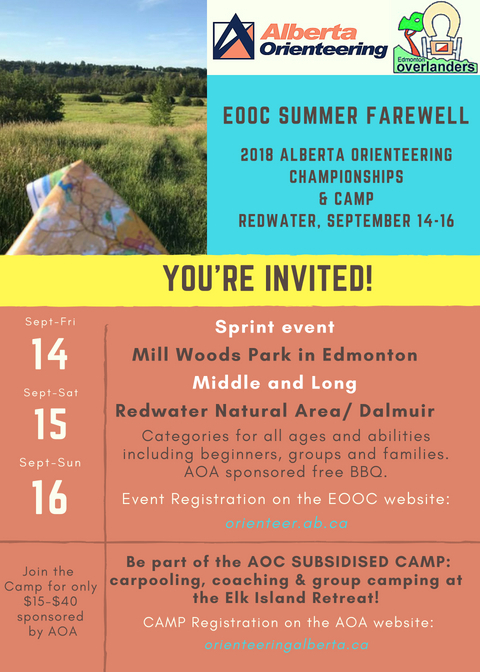 September 14-16 – Alberta Orienteering Championships hosted by EOOC. AOA Retreat and AGM November 2-4 at Deer Valley Meadows. CARRY A BEAR SPRAY it's your BEST defence! Just a reminder that bears are busy and it's berry season! You can run into a wild animal anywhere, whether it being on a busy trail close to town or in the remote backcountry. Knowing how to avoid an encounter with a bear (and other wildlife) is the best way to enjoy the Alberta parks safely. In the event you do come across wildlife, it is important to know a bit about their behaviour. How we respond in an encounter with them really depends on the type of interaction that is taking place. Refreshing your understanding is always a great choice: visit the WILDSMART site before heading out this season.